Star Trek To Boldly Go Into 4K Ultra HD Blu-ray! Star Trek and Star Trek Into Darkness will be Paramount Home Media Distribution’s first two titles released on the new 4K Ultra HD Blu-ray format. Each title will include a bonus disc – with three hours of behind-the-scenes content for Star Trek and two hours of bonus features for Star Trek Into Darkness. In addition, the Star Trek Into Darkness release will include the IMAX® version of the film. Both titles will be released on June 14th. Follow the jump for further details. Star Trek: The Compendium Collects J.J. Abrams’ Blockbusters In Ultimate Blu-Ray Set! J.J. Abrams’ hit Star Trek movies are getting a spiffy new Blu-Ray set, Star Trek: The Compendium, which collects both Star Trek and Star Trek Into Darkness and the IMAX Star Trek Into Darkness along with Digital HD copies of both films and all their original bonus features (including the audio commentary for Star Trek Into Darkness) along with new bonus material unique to this collection: Star Trek Into Darkness Gag Reel; Fitting the future (a look at the film’s out-of-this-world costumes), and Property of Starfleet (sourcing and tracking the film’s myriad props). 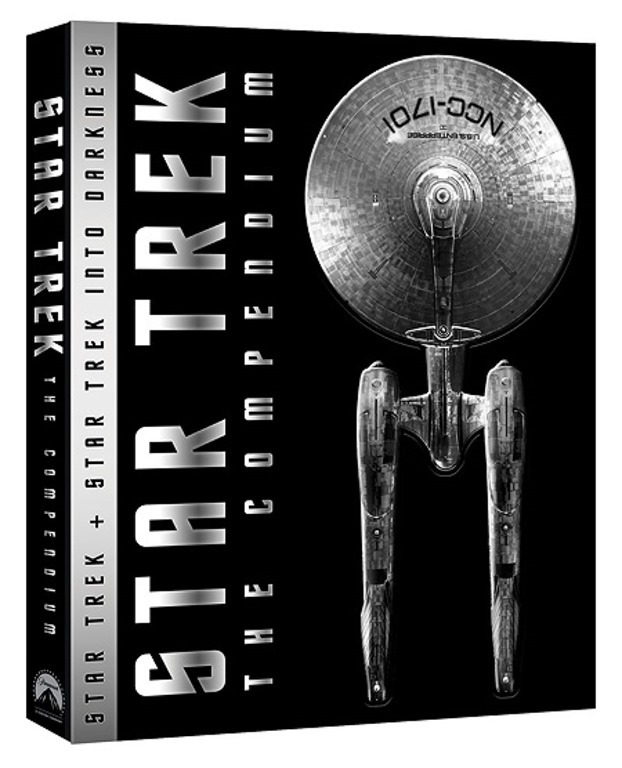 Star Trek: The Compendium Four-Disc Blu-ray Set will be in stores on September 9th. For full details, check out the press release after the jump. 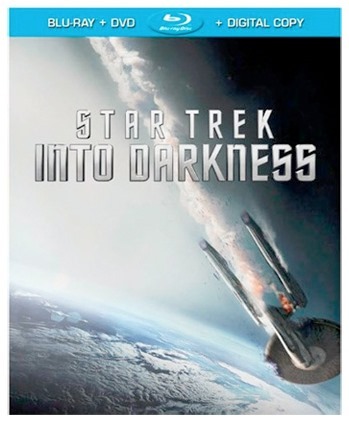 Star Trek Into Darkness In Stores Sept. 10–Digital Download Available August 20! J.J. Abrams’ second Star Trek adventure will be coming to DVD, Blu-ray and On Demand on September 10th, 2013. It will be available on Digital 30 days earlier, on August 20th. The Blu-ray/DVD Combo Pack listing shows seven featurettes on the Blu-ray, but none on the DVD. Star Trek Into Darkness finds the crew of the USS Enterprise on a mission to capture ‘an unstoppable force of destruction and bring those responsible to justice.) The film stars Chris Pine, Zachary Quinto, Benedict Cumberbatch, Simon Pegg, Zoe Saldana, Anton Yelchin, John Cho, Alice Eve, Bruce Greenwood and Peter Weller. Some great headlines and rumors to discuss on this week’s episode of the GeekScholars Movie News podcast! The show kicks off with the hosts discussing the large amount of casting currently underway for the film adaptation of the Broadway musical, Into the Woods. Specifically, it sounds like Meryl Streep, Johnny Deep, Chris Pine, Jake Gyllenhaal, Allison Janney, and Anna Kendrick may all be joining the fairy tale adventure. Also, two movies about chefs are squaring off—Chef starring Jon Favreau, Robert Downey, Jr., and Scarlett Johansson, and a rival picture of the same name starring Bradley Cooper and Michelle Williams. Looking for a place to see Star Trek Into Darkness? Try a Real iMax Theater at a Smithsonian near you! Unfortunately, due to my recent Eye Surgery and Paramount Pictures screening shenanigans (I raise my fist and cry fowl, FOWL!) it will probably be a few weeks before I can experience Trek. For those of you lucky enough to have peepers, see Star Trek: Into Darkness as it was meant to be seen on a real 7 or 10 story tall iMax Screen, not those FakeMax’s in the malls. The DMV is lucky enough to have several real iMax theaters where you can see it. 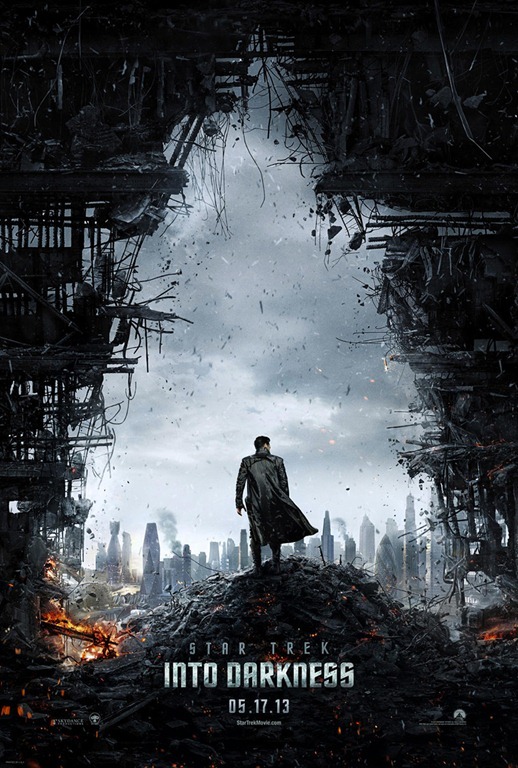 Paramount’s Star Trek Into Darkness opens at the Airbus IMAX Theater at the Steven F.Udvar-Hazy Center in Chantilly, Va., today, May 15, and in IMAX 3-D at the Samuel C. Johnson IMAX Theater at the National Museum of Natural History May 31. Tickets to see the film at the Hazy Center are on sale at www.si.edu/imax. May 2013 Rotten Tomatoes Score Predictions; ‘Never Tell Me the Odds’: Iron Man 4, Abrams and Star Trek 3, Justice League, and More! Blockbuster movie season is officially here! 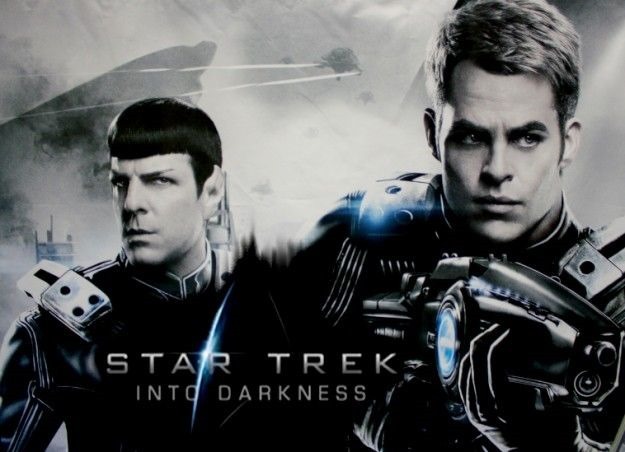 Hot Trailer: Star Trek Into Darkness! Finally! Some new footage – and it is spectacular! International Trailer: Star Trek Into Darkness! Lots of new footage here – and not just of Alice Eve’s Dr. Carol Marcus in her underwear! Even with its fast-paced action and quips, this new Star Trek Into Darkness teaser still doesn’t reveal all that much about the movie – but it does make skipping it seem like not an option. Star Trek Into Darkness with Free App! If you’re looking for a fresh way to dig into the upcoming Star Trek Into Darknes (and you know you are), then you might want to check out a new app based on the movie. Available now from the app store and Google Play, the app will give you access to all kinds of Trek content – as well as the opportunity to take part in missions and win valuable prizes. There’s a good deal more, so follow the jump to get all the details. Golden Globe Nominees! Fantastic Four casting wishes! Reviews abound for the trailers for Star Trek Into Darkness, Pacific Rim, and After Earth! Non-spoiler review for The Hobbit: An Unexpected Journey! Hit play above, or the jump for more details on the show!